Breathing is the process of moving air into and out of the lungs to facilitate gas exchange with the internal environment, mostly by bringing in oxygen and flushing out carbon dioxide – something we all take literally for granted. Have you ever taken a moment to consider the benefits of the different types of breathing techniques that we can use in our day to day lives? Let’s face it- many of you reading this will at some point in your lives have had a degree of anxiety about a dental or medical visit. When we get stressed or tense, our body releases a chemical called adrenaline which causes us to breathe faster and for our muscles to tighten. This only makes matters worse and we become more sensitive to pain. Sounds familiar? How do we overcome this response? Relaxation techniques are a crucial part of delivering pain free dental care for many dentists. Focussing on a deep breathing technique will increase the oxygen reaching our brain. So, how can your dentist use this knowledge to help patients on a day to day basis? A good dentist always believes that patients welcome having some time to talk or discuss their specific anxieties before having any form of treatment. Dental anxieties or phobias exist in many different forms. Some people may have a needle phobia, or a strong gag reflex which may make it difficult to have xrays taken or impressions of the mouth. For some people, just the idea of being in a dental practice can cause severe anxiety. One thing we commonly see is for patients to almost forget about breathing – literally holding their breathe whilst having treatment-tense shoulders, hands gripping the chair and the first thing we have to do is to remind patients that it is okay to be anxious but that we are going to work together with them to help to overcome their fears. Simple things such as a having a gentle tone of voice, asking the patient to make their arms and shoulders become loose and floppy and even guiding the patient into a deep breathing technique are proven to help to reduce anxiety. Dentists should, in our opinion even go as far as reminding patients to focus on the deep breathing technique prior to their appointment. Mindful, slow, deep breathing is incompatible with stress and anxiety. Ancient traditions are being scientifically proven to show the tremendous benefits we can derive from devoting time every day to breathing exercises. Being aware of your breathing in the moment as we rhythmically and slowly breathe in and out, makes us feel relaxed, calm and grounds us in the moment. After following this advice many of our own patients tell us what an immense difference this makes and with daily breathing exercises just for a few minutes everyday our body can be trained to automatically use this technique to combat any stressful situation we are faced with. What else can be used to make dentistry more comfortable? Dentist can use the deep breathing relaxation techniques alongside a variety of therapies which can help us to relax including the use of relaxing aromatherapy, the use of a STOP signal, the use of a topical numbing gel (that even has a taste and smell of bubble gum!) and the use of the pain free injection system – The Wand. 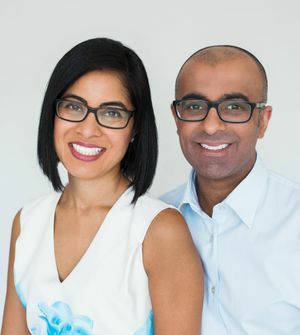 Lina and Shrik Kotecha are both Dental Phobia Certified dentists based at Glen Dental in Great Glen, Leicester and have years of experience of helping their dental patients master the art of a precise breathing technique to overcome anxieties that people may have when visiting a dentist.